Web pages with large and uncompressed image files are going to load more slowly than pages with correctly-sized and properly-optimized images. While there’s hundreds of apps available to resize and compress image files, few (if any) are easier to use than Bzzt! Image Editor. Bzzt! 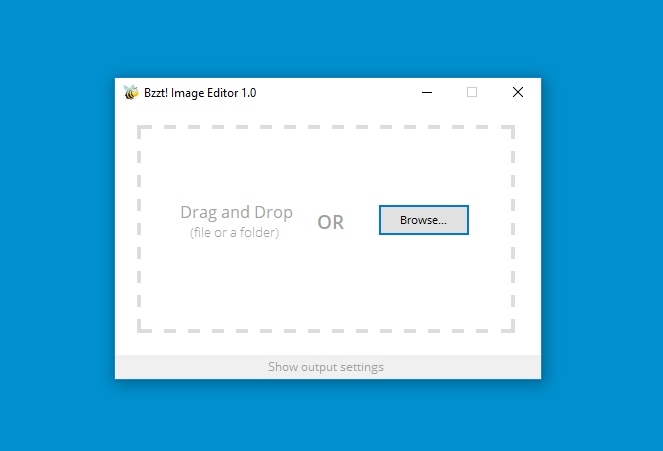 Image Editor is a small Windows app that makes it super-easy to create web-friendly images. Once you’ve set your output size and quality preferences, just drag-and-drop the files you want to optimize onto the UI and Bzzt! will process them instantly. You can even process entire folders full of images at a time. Bzzt! can process files in every major image format—plus quite a few obscure ones—and output either PNG or JPG files. If you select JPG, you’ll be able to control the quality level of the resulting file to get even smaller filesizes. Both PNG and JPG files also pass through a lossless compression algorithm prior to being output to get the smallest possible filesizes. Images can be resized and rotated to ensure they’re the exact right size to fit onto your website. There are also more granular configuration options that allow you to control where output files are saved, how their filename will be structured and whether aspect ratios and other properties will be preserved. Bzzt! Image Editor is completely free to download and use. It run on Windows 7 and newer and requires that the Microsoft .NET Framework be installed. This is automatically installed with Windows, so the majority of users shouldn’t need to download any additional software.